While it is generally believed that Roger Taylor was born in King's Lynn, this is not strictly true; merely, his birth was registered there. He was, in fact, born in The Wash, or rather, in a small dinghy floating on The Wash. In 1948, Roger's parents were living on one of the Cocos Islands in the Indian Ocean where Mr. Taylor worked at the important meteorological station. The Islands were then a British, or more accurately, Scottish colony. On the world scene, many countries, notably India and Israel, were striving to make independence work. Mrs. Taylor was, in the parlance of the day, "in an interesting condition", and it was feared that if the islands were to throw off the yoke of British dominion, then the child, if it were a boy, would be denied the right to play for England at cricket. Therefore, Mr. and Mrs. Taylor set sail for Blighty in their ocean-going yacht, the "Titania". Alas, it was an ill-starred voyage. Shortly after passing through the Strait of Gibraltar into the Atlantic Ocean, the yacht was caught in a terrifying storm which swept her far to the north. Two days later, fog-bound, "Titania" struck an iceberg and sank. Taking refuge in the tiny dinghy that served as a lifeboat, the Taylors floated for many days at the mercy of the winds and tides with no sight of land. Thus it was that Roger was born, adrift in The Wash, on Tuesday, 26th. July, 1949, at 9.00p.m. as measured by the sun. Mrs. Taylor had learned to tell the time by the sun and stars from her mother, the pioneering aviatrix, Aurelia Fairheart, famed for her solo flight from London to New York in 1924. New York, Lincolnshire, that is. Unfortunately, she had never learned to navigate by the sun and stars, and hence inadvertently turned right at Chiswick. In fact, it was aviation that brought Roger's parents together. As her contribution to the war effort, Roger's mother, herself an aviatrix, flew a Lysander over to Normandy to rescue two R.A.F. pilots. One, Roger's father had been working for the French resistance after he was shot down. After a spectacularly successful sabotage attack on a secret nuclear missile development base outside Querqueville, it was deemed too dangerous for Mr. Taylor to remain. He was finally airlifted to safety by his future wife after spending several months hiding out in a little café owned by one, René Artois. In recognition of his courageous contribution to the liberation of France, he was recommended for the Croix de Guerre, but General de Gaulle, on learning that the valiant saboteur was not only an Englishman, but also the son of a sheep farmer, said, "Non!" All this, of course, was a very hard act to follow, and much was expected of Roger. This goes a long way to explaining both his manifest rebellious streak and dauntless spirit of adventure. By 1960, Roger was keenly interested in science, and showed considerable talent. He longed for a pet cat, but his mother refused to countenance his bringing animals into the house. Thus began "Operation Wildcat". Making use of his father's workshop at the back of the house, he collected together the corpses of numerous animals which he had found when rambling one weekend. Having dissected out the least damaged or decayed portions, he carefully arranged and connected these animal parts into something that was a reasonably close approximation to a cat. It had, besides the head of a tabby cat, three legs of a Jack Russell, one foreleg of a hare, the body of a polecat, and a fox's brush. Surprisingly, it didn't look too bad. Then came the problem of gathering enough power to animate it. Fortunately, or otherwise as it turned out, that evening there was a spectacular thunderstorm. Roger instantly spotted its potential. Seizing a kite and some fine copper wire, he soon had the kite aloft, with the wire connecting it to his creation. He did not have long to wait before lightning hit the desired target. The experience with the kite obviously had a strong effect on Roger as for some time he became almost obsessed with them, creating larger and larger versions with different aerodynamics. One weekend, shortly after his eleventh birthday, the family set off on an expedition of pleasure to Land's End. Roger took with him his latest model, which was cleverly designed so as to be collapsible for easy transportation. The afternoon was sunny and hot, giving strong up draughts - ideal kite-flying weather. The kite was no sooner assembled than it was aloft. It was a wonderful construction, painted sky blue and decorated with a large, black bird of prey; Roger said it was a condor. A strong breeze developed, making the kite dip and weave like the great bird it purported to be, and he had difficulty controlling it, as if it had a life of its own. Suddenly he gave a shriek, part fright and part delight as the Condor lifted him off his feet. His father leapt after him, but too late as the stiffening breeze carried him away towards the cliffs. 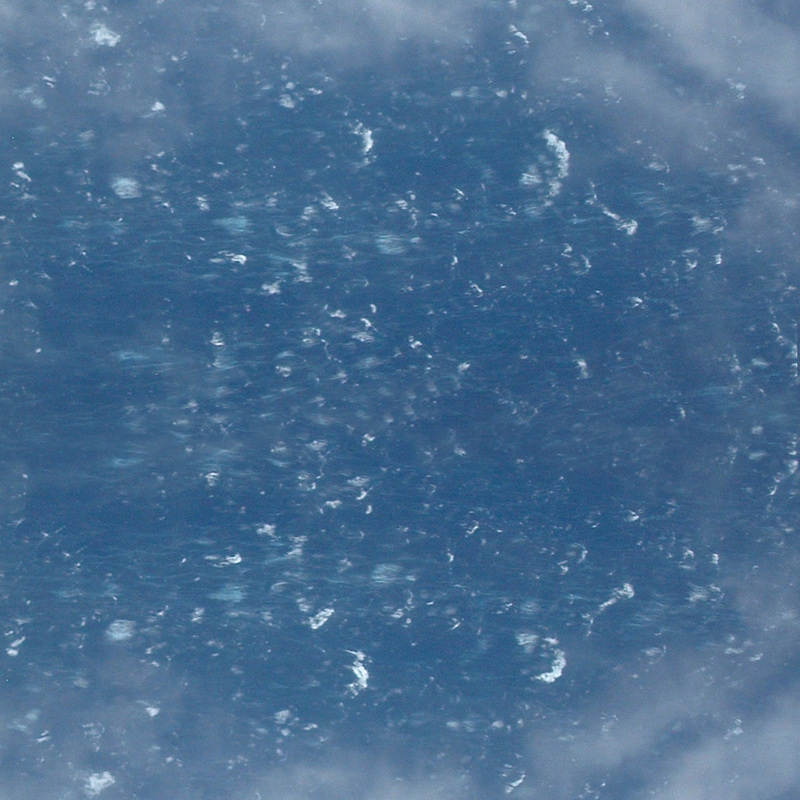 Soon he was just a tiny dwindling speck sailing higher and higher above the channel. He rose rapidly to three or four thousand feet where he had encountered much stronger winds. About half way across the channel, he was buzzed by a Gloster Javelin of the R.A.F., as the metal framework of the Condor had caused an unexplained blip on its radar screen. Being unable to ascertain the nature of the blip, the pilot deduced that it was a cunning new espionage device of the U.S.S.R. and fired one of its four Firestreak missiles at the intruder. As it happened, the missile homed in on a larger, more distant target, and the U.S.A.F. lost its second U2 spy plane that year. Shortly after this, a Dassault Étendard of the French Armée de l'Air made the same mistake and fired one of its four Sidewinder missiles. This in its turn found an alternative target and brought down the MiG-19 which had been shadowing the U2. The affair very nearly precipitated World War III. There was much political activity at the highest level among all interested countries, but eventually the international incident was sorted out. The world returned to its normal cold war status, the only casualty being the Prime Minister of Jordan, who was assassinated. The reason for this was never fully established. On reaching the coast of France somewhere along the Cherbourg peninsula, Roger was swept upwards by a strong up draught to where he was picked up by a steady cross-current which carried him far south towards the Pyrenees. Over the foothills, the Condor was spotted by a gigantic bird, much like illustrations Roger had seen of the roc in the tales of Sinbad. 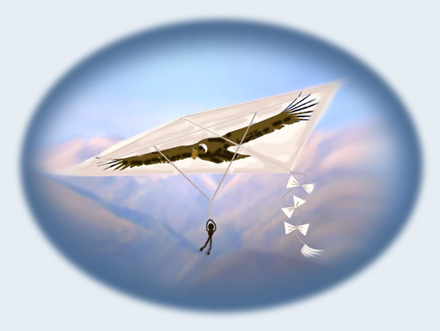 It circled the kite slowly with scarcely a wing beat, then it spotted the Condor's "prey" dangling below. Languidly, it swooped and wrapped its talons around Roger, then carried him off to its nest on the eastern flank of Monte Perdido, presumably intending to feed him to its offspring. Paralysed with fright and cold, he had not even twitched since the "roc" captured him, which probably saved his life, since, having dropped its inert prey, it immediately flew off again. Sharp prodding by the beaks of the three fledglings with which he shared the nest roused him from his stupor. It appeared to be mere curiosity since Roger was also sharing the nest with the fresh remains of an indeterminate number of sheep. This was no place to hang around, though. He had retained his grip on the handles of the spool of cord, and reeled in the kite. It had come apart in places when it crashed into the side of the cliff on which was perched the "roc"'s nest, but it was not irretrievably damaged. This was just as well, since there was no way down save by the way he arrived. Having effected a speedy repair, Roger grasped the central framework and launched himself off the cliff - possibly the first hang-glider flight since Otto Lilienthal in the last century. It was later discovered that the "roc" was in fact a hitherto undiscovered species of bearded vulture, or lammergaier, subsequently named Gypaetus barbatus ingentissimus Tayloris in his honour. As Roger was gliding down the valley of the Baise towards its confluence with the Garonne, it suddenly occurred to him that he had neither money nor passport, and his knowledge of the French language was limited to "Parlay voo onglay" and "urn, der, twar, catra, sank," which is what his heart did when this realization struck him. Still, Roger is not given to brooding overmuch about what cannot be avoided, and with the confidence of youth, reassured himself that everything was bound to turn out all right in the end, which, indeed, it did. Roger eventually landed the Condor in gathering darkness in a vineyard a little to the south of the village of Margaux. By great good fortune, the lady who answered his knock at her door spoke English, although, when she first clapped eyes on Roger, she was temporarily bereft of speech. Pulling herself together rapidly, she said, "You are Onglish, non?" Roger suddenly discovered that his command of the language was not so limited as he had first thought, and replied, "Oui, Madame." Madame, obviously agitated, though he did not at this time see why, whisked him rapidly into a barn adjacent to the house, saying urgently, "My 'isband - 'e must not sue you!" Inside the barn, she continued, "You can sloop in zee 'ayloft for tonight, and tomorrow, I will 'elp you to escape. Eet will be quite like old tomes..."
With that, she left hurriedly, leaving Roger a prey to fears of some latter-day Bluebeard who ate children for breakfast. He did not feel particularly reassured when Madame returned a little while later with a repast suitable to sustain a growing boy. Was he going to be fattened up first? Then he recalled that she had said she would help him to escape, discovered that he was famished and demolished the lot in short order before climbing into the hayloft where he fell into an exhausted sleep. He was awakened at dawn by a most frightful racket. At first, he thought it was some sort of siren, but it was only an over-enthusiastic cockerel. Remembering that he must not be seen, he remained in hiding until Madame's husband departed for the morning's work in his vineyard. Cautiously, he approached the house. The kitchen door was open, letting in the long rays of the rising sun. Inside, Madame's three sons were finishing breakfast. The two younger ones, both dark, had their backs to the door; their blond haired senior, who was some four or five years older than Roger, was facing it. He could almost have been Roger's brother. Madame Michelle Crabtree was not at all happy about the chance meeting; her husband was so far unaware that their eldest child, Beauregard, was not his own son, and accepted his wife's assurances that Beau had been born prematurely. Beau's father, another British airman, had left France some six weeks before Michelle's wedding. Maybe the two golden-haired boys didn't have the same father, but Michelle was not going to risk having to give awkward and unconvincing explanations. Consequently, Roger found himself on the Bordeaux-Paris express, with generous helpings of food and French francs, and instructions, given only once, to alight at Orléans. There he was to take a taxi to Fleury-les-Aubrais, where her old friend, Madame Yvette Alphonse, had a small chateau. Madame Alphonse would, on reading the letter Madame Crabtree was sending with Roger, arrange for his safe and speedy return to England. Madame Alphonse was the widow of an elderly undertaker whose dickey ticker had given out the day after their wedding, leaving her a wealthy widow. With her inheritance, she had bought the Chateau de Coeur-Branlant. The money was insufficient to maintain her in the style to which she had become accustomed, however, so having run through one fortune, she set about gaining another by converting the chateau into a very stylish «lupanar». She also changed its name to the Chateau des Jouissances. Having read Michelle's letter, Madame Alphonse clasped Roger in a smothering embrace redolent of Parisian night-life, and gave him into the care of Mademoiselle Laverne. Laverne spoke a reasonable amount of English, much of which she had picked up from the chateau's English clients. Some of it was unfamiliar to Roger. Naturally, he added these words to his vocabulary, and equally predictably got into trouble for using them when he finally returned home. Finally came the day that Madame Alphonse found someone willing to transport her youthful guest to his native soil. The gentleman concerned, who asked to be called "John", took Roger to St. Malo where his private yacht was moored, and thence across the channel to the Cornish coast. Here, he was taken ashore by dinghy and dropped off at Pendennis Point to the east of Falmouth. From there, he found his way to Kimberley Park Road police station, his head still full of the delights of high living, and the intention of somehow acquiring such a lifestyle for himself.